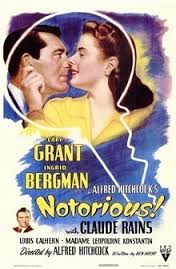 Notorious is playing this weekend at Tampa Theatre as part of the Summer Film Series. See it Sunday, July 10th at 3:00 pm. Notoriousis one of Hitchcocks best films. Why? Not because of the well-known movie stars that grace the film. Cary Grant and Ingrid Bergman are at the top of their game, but ironically, it’s not their performances that stand out in this movie. Next Next post: Recommended Tarzan viewing: Go back to the Source!